The high mortality rate in alleged clashes between police and gang members in El Salvador in 2016 drew the attention of the Inter-American Commission on Human Rights (IACHR). Commissioner James Cavallaro raises the question: are extrajudicial executions of alleged gang members retroactively approved by state policy? Jaime Martínez, Director of the National Academy of Public Security and former defender of human rights, has been the government’s strongest defender, to the point of undermining official statistics. In 2016, a collaborative panel formed by representatives from the Attorney General's Office, the Institute of Legal Medicine, and the National Civil Police registered the deaths of 591 gang members in armed clashes with the police and army. The panel also recorded the deaths of eight policemen, two soldiers, and 17 civilians. When the number of gang members is divided by the total number of authority figures killed, (591 divided by 10) the result shows 59 gang members died for every authority figure killed in armed clashes. This information was presented by Verónica Reyna of the Servicio Social Pasionista (SSPAS) to the IACHR during a hearing held on September 5 about cases of alleged extrajudicial executions committed in El Salvador. The proportion of deaths caught the attention of IACHR commissioner James Cavallaro, who suspects there might be a state policy to exterminate gang members. The government’s representative at the IACHR hearing, Deputy Minister of Justice and Public Security Raúl López, did not deny possible abuses, but ruled out the idea of a government order to systematically end gangs. López committed to collect data about people injured in these clashes, open appropriate investigations, and align case monitoring with a human rights approach. The hearing before the IACHR came two weeks after a publication by Factum, which pointed to a systematic practice of extrajudicial executions against gang members within the national police force. The Factum publication also says that elite police groups have also committed crimes such as sexual assault and extortion against the civil population. Since then, some security officials have tried to downplay statistics, and have questioned human rights organizations that are following up on these allegations, according to a September 14 statement from Cristosal, SSPAS, the Institute of Human Rights at Central American University (IDHUCA), and the Foundation for the Study of Law Enforcement (FESPAD). One of the most critical voices has been Jaime Martínez. The organization he directs, the National Academy of Public Security, is in charge of training police officers. On September 12, Martínez said the figures are meaningless and Commissioner Cavallaro's assessment is rushed. Martínez than started a conversation on the institution's 25-year history. "Let’s do some simple arithmetic. If, for every police officer who dies, there are 59 gang members killed, that would mean if 200 police officers have died in armed clashes, then almost 12,000 gang members would have been executed in the last 25 years. And that is not true," Martínez said. But Martínez, who has directed the National Academy of Public Security since 2009, did not take into account that these figures only refer to deaths from armed clashes in 2016. Martínez added: "We should evaluate what the figures refer to when say they are 59 dead for each police officer, because there might be gang members who kill each other, or internal purges," said Martinez. “So we have to be careful." "It seems to me, with all due respect, that he (Commissioner James Cavallaro) made a hurried evaluation which should be subject to verification." The data presented by Reyna, the SSPAS representative, came from a report presented by SSPAS’s Human Rights Observatory. Since 2014, this organization has submitted a report on human rights violations each year. The report collects data on national incidences and allegations of cases registered in its area of nfluence, specifically in Mejicanos, Ayutuxtepeque and Cuscatancingo. The information about the proportion of deaths of suspected gang members compared with security forces had already been publicly presented on June 15th. According to Reyna, the information was obtained by requesting access to public information sent to the Attorney General's Office. In addition to last year's data, the information provided also shows that since 2014, the year in which killings were dismissed after the disruption of the truce between the government and the gangs, victims in armed confrontations have quintupled from 112 deaths to 618 in 2016. "It is difficult for the government to recognize that gangs can also be victims, with all their war speech against them. (...) We are asking that the rate be investigated and objectively verified, so that it can be determined if there is guilt or not; but this shouldn’t be a problem—the idea is that you can professionalize the police and the investigative capacity of the Attorney General's Office," said Reyna. 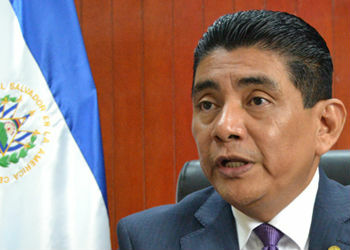 Martínez, also known for his long career as a human rights defender at FESPAD, has made other questionable statements. SSPAS and IDHUCA brought up his words during a police graduation ceremony last May during the IACHR hearing. On that occasion, Martínez warned police not to shake hands with criminals. "The full legitimacy of the state is in your hands. Do not let them shake your hand. Don’t think there might be human rights involved, don’t think about possible criticism from the press or international organizations: when the state’s legitimacy is disrespected, you have to make use of all the tactics and lessons for the situation," Martinez said at the graduation. Although the Academic Council of the National Academy of Public Security endorsed the director’s words, human rights prosecutor Raquel Caballero reported on May 6 through his Twitter account that he would initiate an investigation of police officers’ formative processes, in response to the "lamentable" statements of Martinez. On September 11, United Nations High Commissioner for Human Rights Zeid Ra'ad Al Hussein included El Salvador in a list of 50 countries with high levels of violence due to organized crime and the corruption of justice. According to the High Commissioner’s representative in Central America, Alberto Brunori, Zeid is expected to visit the country in November. Although Martínez said he valued and respected the work carried out by the IACHR and Commissioner Cavallaro, as well as the media that published cases on extrajudicial executions, he questioned the interest of human rights organizations and suggested relationships with gangs as a reason for wanting to attack the police institution. "Some human rights organizations are targeted…that worries me a lot because they could be laying the groundwork to disarm society’s last layer of protection. They (the organizations), unless they have other types of relationships with gang members, could be victims who will be protected by police," Martinez said.